Some of God’s people nowadays have really good intentions, but are mistakenly trying to be smarter than God. We’ve also got a lot of compromise & covetousness in “ministry”. We have people singing and preaching a compromised message. As a result of the compromised message they end up committing spiritual adultery with the world and practicing idolatry (See what Jesus said concerning Jezebel in Revelations 2). If they don’t repent, Jesus will kill them with death and put her followers into great tribulation. Let’s go back and take a look at Jesus’ first message. After he officially started his ministry (at a wedding), the first public thing he did was overturn temple, rebuking false people in religious authority (John 2:14-15). What was Jesus’ first message? 15: And saying, The time is fulfilled, and the kingdom of God is at hand: repent ye, and believe the gospel. Look at the record of His first message in the book of Matthew. Matthew 1:17 From that time Jesus BEGAN to preach and to say Repent, for the Kingdom of Heaven is at hand. Did Jesus say, let me heal everybody first and build my relationships before I ease in the repentance message maybe sometime later? – NO. Did Jesus try to attract as many people as possible with a positive and non-confrontational message, and then bring conviction and repentance into the picture afterwards? – NO. Did Jesus try to get as many fans as possible first, or try to gain influence through relationships with influential sinners… and then bring the hard message of repentance in slowly after his platform was already set? – NO. Jesus BEGAN His ministry message with repentance. Repentance means turn from what you are doing now, implying that what you are doing now is wrong. That brings a feeling of guilt and conviction. Did Jesus have love? Yes. Did Jesus show love to all? Yes. Did Jesus heal people and cast out demons and do miracles? Yes. Did Jesus meet peoples natural and physical and emotional needs? Yes. Did Jesus hide the truth and save the hard message of repentance until later – after he had done everything else first? – NO. Actually, it was reversed. Jesus did the healing and relationship-building after people knew what He stood for and pointedly preached. He preached repentance from sin and the Kingdom of God. Most of the people who came to Him were already humbled by the message of repentance. People love to acknowledge that Jesus ate with sinners, but let’s also acknowledge that those sinners were repenting due to the message that Jesus was actually preaching. I’m not saying you have to clean yourself up before you come to Christ. I am saying there is a humility that you take when coming before God. There always has, and there always will. God only hangs with humble people (James 5, 1 Peter 5). That’s why preaching repentance is primary, if you really want people to get to God. When Jesus preached, the only non-repentant people were the Pharisees… They had their own religious beliefs that prevented them from feeling the need to repent. They came to attack Jesus, and they got attacked back with Truth. The people that fight the message of repentance (change towards God) and holiness – Gods purpose in everything – are normally the people who are comfortable in their very-own, personally invested, religious tradition. Let’s look at the forerunner of Jesus – John the Baptist. This was the prophet called to introduce people to Jesus. What did he preach? …the word of God came unto John the son of Zacharias in the wilderness. 8: Bring forth therefore fruits worthy of repentance, and begin not to say within yourselves, We have Abraham to our father: for I say unto you, That God is able of these stones to raise up children unto Abraham. 9: And now also the axe is laid unto the root of the trees: every tree therefore which bringeth not forth good fruit is hewn down, and cast into the fire. 10: And the people asked him, saying, What shall we do then? 11: He answereth and saith unto them, He that hath two coats, let him impart to him that hath none; and he that hath meat, let him do likewise. 12: Then came also publicans to be baptized, and said unto him, Master, what shall we do? 13: And he said unto them, Exact no more than that which is appointed you. 14: And the soldiers likewise demanded of him, saying, And what shall we do? And he said unto them, Do violence to no man, neither accuse any falsely; and be content with your wages. He preached the baptism of repentance for the remission of sins (Cancer that is in remission is not active). He demanded proof and results of repentance. Not only was John direct, he was also specific and bossy! Let’s go back to Jesus… Whom did Jesus get most of his initial disciples from? They were initially followers of John the Baptist, who had repented with John’s Baptism of Repentance. John the Baptist prepared many people to receive Jesus Christ by preaching repentance. Most of the people that rejected John’s message also rejected Jesus. Most of the people that received John’s message also ended up receiving Jesus’ message; even way later after Jesus died & rose again (See Acts 19:3-5, Acts 18:25). So how people respond to the message of repentance is a clue to how they will eventually respond to Jesus. Don’t let anyone tell you that you can’t preach holiness or repentance, that all you can do is build relationships and hope that people will maybe sometime repent later. You don’t have to be mean, but you do have to be clear. Relationship evangelism is good, but you don’t have to hide holiness and repentance. 21: Keep yourselves in the love of God, looking for the mercy of our Lord Jesus Christ unto eternal life. 23: And others save with fear, pulling them out of the fire; hating even the garment spotted by the flesh. On some have compassion… save some with fear and hatred. (Not hatred of the people, but hatred of sin). 10: And the disciples came, and said unto him, Why speakest thou unto them in parables? 11: He answered and said unto them, Because it is given unto you to know the mysteries of the kingdom of heaven, but to them it is not given. 12: For whosoever hath, to him shall be given, and he shall have more abundance: but whosoever hath not, from him shall be taken away even that he hath. 13: Therefore speak I to them in parables: because they seeing see not; and hearing they hear not, neither do they understand. 15: For this people’s heart is waxed gross, and their ears are dull of hearing, and their eyes they have closed; lest at any time they should see with their eyes, and hear with their ears, and should understand with their heart, and should be converted, and I should heal them. 16: But blessed are your eyes, for they see: and your ears, for they hear. 35: That it might be fulfilled which was spoken by the prophet, saying, I will open my mouth in parables; I will utter things which have been kept secret from the foundation of the world. 36: Then Jesus sent the multitude away, and went into the house: and his disciples came unto him, saying, Declare unto us the parable of the tares of the field. In other words: Jesus told parables to the hardhearted, spiritually dull, and rebellious who had already rejected His previous message of repentance. After Jesus told parables to the masses, He then INTERPRETED parables to His DISCIPLES. Then when He died on the cross and rose from the dead, He told His disciples to go MAKE MORE DISCIPLES. He did not tell them to go minister parables and make lots of money, but to go make more disciples. Those disciples would then pass on the CLEAR INTERPRETATION to make more disciples. So the key to ministry with parables is not the parable, but it is the CLEAR INTERPRETATION. If you are telling parables without giving the CLEAR and Direct INTERPRETATION of the parable – you are not following Jesus Christ Ministry Techniques for making disciples. I encourage you – don’t just speak the language of the world – bring them into the concepts of the Kingdom of God. There’s nothing wrong with building relationships and having compassion. There’s also nothing wrong with harsh warnings and repentance preaching. Mature, Spirit-led Christians use BOTH, not just one or the other. When it comes to “ministry”, the greatest example is Jesus Christ the King. Also, realize that there are many different personality types, ministry styles, gifts, and callings. Don’t let anyone squash yours. Be yourself and do what God has built you and instructs you to do. Above all, obey God. 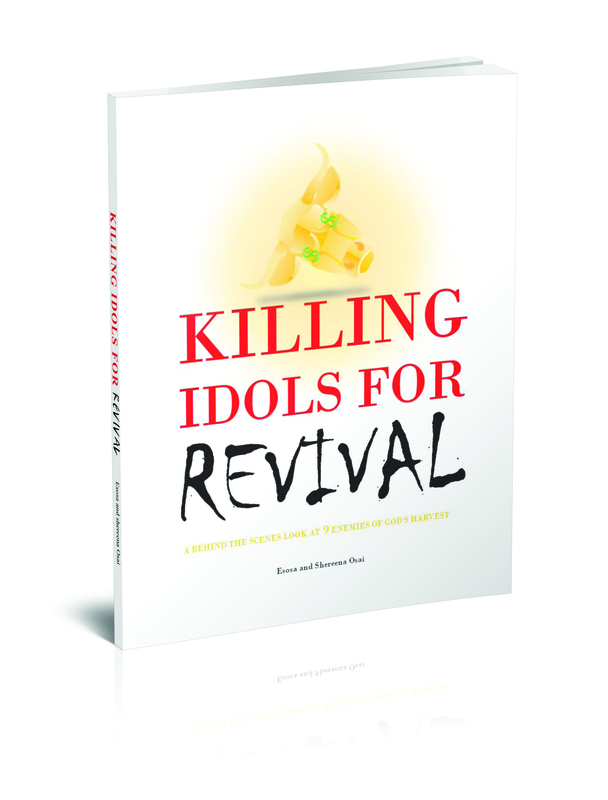 – Read Killing Idols For REVIVAL to be equipped and confident in the Spirit of Elijah that is necessary for the return of Christ!